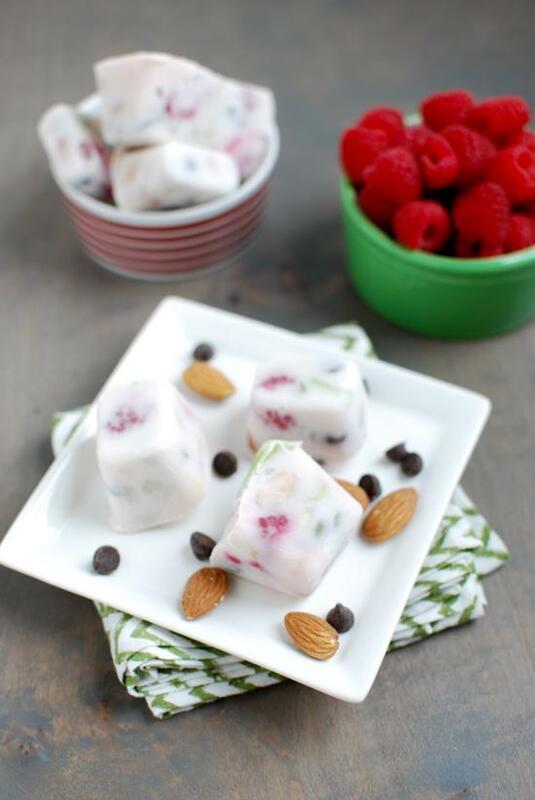 These Frozen Yogurt Bites are easy to customize and make a healthy snack or breakfast for both kids and adults! First of all, sorry about the other day when I posted a Fitness Friday post on a Wednesday. #mombrain. I think I originally had the post titled Crossfit After Baby so it wouldn’t matter when I posted it, but then I changed the title and didn’t really think things through! Whoops. Anyways, we’re back to recipes today. This recipe is actually just a slight spin on one of my all-time favorites. About 2.5 years ago I posted these Frozen Yogurt Trail Mix Bars. They were wildly popular (for good reason) and I still make them all the time. However, I usually make them bite-sized instead cutting them into bars. I just find they’re less messy, easier to eat, more fun, etc! So, I thought since I changed things up a little, I’d make a brand new post! First of all, it’s summer and I wanted to remind all of you of these delicious treats. Secondly, I make these all the time during Sunday food prep and always get questions about them so I wanted to have a post I could direct you to so you can make them yourself! Third, they needed some new photos! So anyways, you don’t really need specific quantities for these, which is another reason I like them. They’re totally customizable and so easy to make. If you end up mixing too much to fit in your ice cube trays, just eat the rest for a snack! 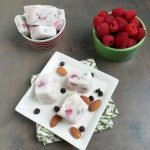 This recipe for Frozen Yogurt Bites is easy to customize and makes a perfect healthy snack or breakfast for both kids and adults! Use a knife to gently pop frozen cubes out of mold and store in an airtight container in the freezer. Let sit for a couple minutes before eating if they’re too hard to bite into! My favorite mix-ins are chopped almonds, chocolate chips and chopped fruit. Use any yogurt you like – greek, regular, full-fat, fat-free, non-dairy, whatever! These Frozen Yogurt Bites from @leangrnblog are perfect for breakfast or snack time! So happy you said non-dairy would work! I love these, they’re so cute! Yum! What a perfect summer treat! My kids love putting yogurt tubes in the freezer for a summer treat. Even better when it’s got yummy mix ins! What kind of yogurt do you typically use? I saw this same snack idea in a wegmans magazine and tried it with 2% fage, but they were pretty icy/watery tasting. I’m wondering if I just need to try a different yogurt? i usually use full fat stonyfield or siggis but i’ve tried with several kinds. great idea! i love your yogurt bites! i’m going to try to make yogurt melts for william! I am in mega need of healthy, high protein snacks, so these are PERFECTION! But LOVE making frozen yogurt bites like this, such a great snack! what an awesome idea! Love these and know my kids will too! these look great..i saw some with chia seeds and berries. These look awesome – will have to give them a try. They look perfect for a hot, summer afternoon. I would put a popsicle stick in these and have mini frozen treats! WOW!! These look awesome! So healthy, delicious and yummy!! Hi Lindsay, this is a great idea and I’m sure my daughter will love it. Thank you for sharing this one. I will try it soon together with my little girl. I just wondered what the green was that I can see in the Frozen Yoghurt Bites? My guess is mint but I’m not certain. Thanks for your recipes. [WORDPRESS HASHCASH] The comment’s server IP (192.0.99.134) doesn’t match the comment’s URL host IP (192.0.78.24) and so is spam.